www.concreteproducts.com JuLY 2014 • 23 NEWS SCOPE PRODUCERS New Quebec administration supports McInnis Cement Leaders in the newly elected Quebec govern- ment have confirmed the major financial commitment—$100 million equity stake plus $250 million in senior debt—the predecessor administration announced earlier this year for the $1.1 billion McInnis Cement plant and marine terminal in Port-Daniel-Gascons. "When we came to offce, our government vowed to review this project with the exec- utives of McInnis Cement and their fnancial partners," says Minister of Economy, Innova- tion and Export Trade Jacques Daoust. "We looked at three aspects of the project, namely the fnancial structure, its impact on trade agreements, and strength of the business plan. Having received satisfactory answers, we are now in a position to support this project, which will bear signifcant economic benefts for the Gaspé and Magdalen Islands region." Formally outlined in February, the Port-Daniel-Gascons plant will have about 2.5 million tons' annual production capacity. Anchoring an export-driven business model, an adjacent marine terminal will be equipped to load barges—bound for Great Lakes and Northeast U.S. markets via the readily accessi- ble St. Lawrence Seaway and Atlantic Ocean— at rates up to 2,000 tons/hour. McInnis Ce- ment recently acquired land adjacent to the limestone-rich, 850-acre site it already owns to provide substantial backup reserves and guarantee the mill's long-term viability. PENNECON CONCRETE DIVISION SEEDS NEWCRETE INVESTMENTS Backed by Toronto private equity operator Banyan Capital Partners, Pennecon Ltd. Chief Executive Offcer Larry Puddister has led a management team buyout of the company's ready mixed, precast and concrete block & paver business—serv- ing markets in the far eastern reaches of North America. Based in St. John's, it will operate as Newcrete Investments Limited Part- nership, covering Newfoundland and Labrador, where Pennecon has heavy/ civil construction, energy and real estate interests. With a payroll exceeding 150, Newcrete Investments runs the eastern Maritimes' largest feet concrete boom pump truck feet, plus the region's only automated concrete masonry production line, whose offerings include Keystone segmental retaining wall units. 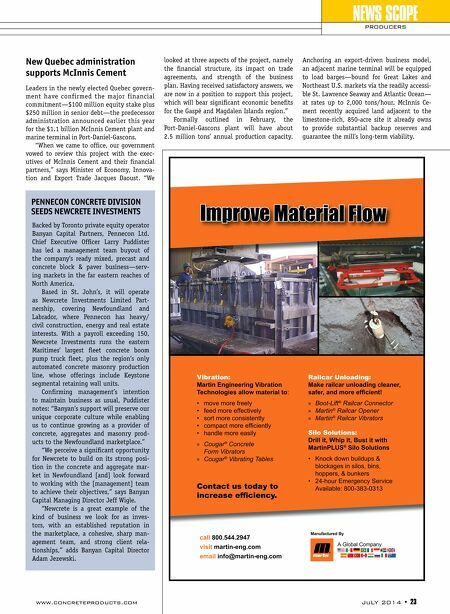 Confrming management's intention to maintain business as usual, Puddister notes: "Banyan's support will preserve our unique corporate culture while enabling us to continue growing as a provider of concrete, aggregates and masonry prod- ucts to the Newfoundland marketplace." 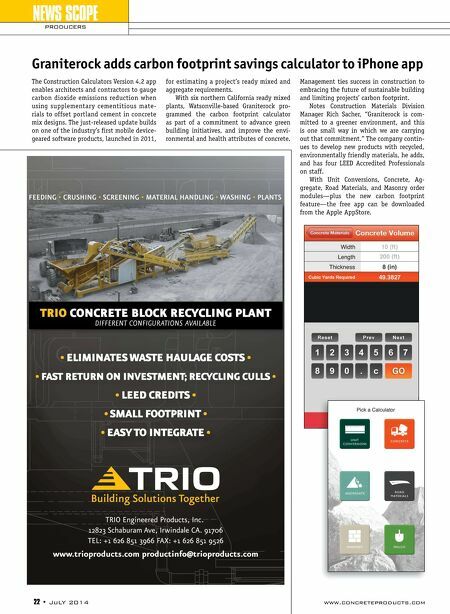 "We perceive a signifcant opportunity for Newcrete to build on its strong posi- tion in the concrete and aggregate mar- ket in Newfoundland [and] look forward to working with the [management] team to achieve their objectives," says Banyan Capital Managing Director Jeff Wigle. "Newcrete is a great example of the kind of business we look for as inves- tors, with an established reputation in the marketplace, a cohesive, sharp man- agement team, and strong client rela- tionships," adds Banyan Capital Director Adam Jezewski. call 800.544.2947 visit martin-eng.com email info@martin-eng.com A Global Company Manufactured By Improve Material Flow Vibration: Martin Engineering Vibration Technologies allow material to: • move more freely • feed more effectively • sort more consistently • compact more effi ciently • handle more easily » Cougar ® Concrete Form Vibrators » Cougar ® Vibrating Tables Railcar Unloading: Make railcar unloading cleaner, safer, and more effi cient! » Boot-Lift ® Railcar Connector » Martin ® Railcar Opener » Martin ® Railcar Vibrators Silo Solutions: Drill it, Whip it, Bust it with MartinPLUS ® Silo Solutions • Knock down buildups & blockages in silos, bins, hoppers, & bunkers • 24-hour Emergency Service Available: 800-383-0313 Contact us today to increase effi ciency.